— a first-of-its-kind, 60-ton-capacity, fully articulated hauler that invites customers to rethink the way they’re moving material. In 1966, Volvo introduced the industry’s first articulated hauler — the 10-ton DR 631, known as Gravel Charlie. Fifty years and 50 tons later, the A60H marks another Volvo milestone. Built upon the same engineering advancements as its smaller, industry-leading counterparts, the A60H provides the same off-road capability, now with an impressive 60-ton payload capacity. This new-to-industry hauler class opens increased production opportunities and cost savings potential not previously possible with smaller articulated haulers or rigid trucks in the 60-ton size class. Powered by a 673-horsepower Volvo D16J engine and built upon the legendary Volvo platform, the A60H goes where others can’t. The active hydraulic front suspension, hydro-mechanical steering and high ground clearance at the articulation joint enable the A60H to easily and comfortably navigate severe terrain, and the rotating hitch design makes the articulation joint virtually maintenance-free. 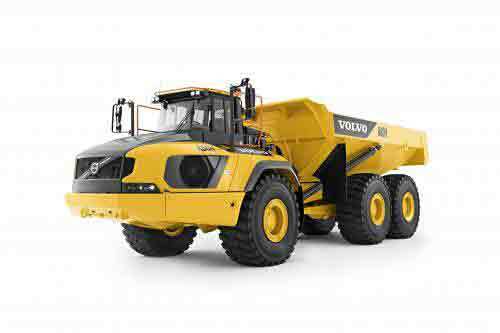 Automatic traction control (ATC) and 100-percent differential locks continue to be a competitive advantage for Volvo. The no-slip, no-wear differential locks work in 4x6 and 6x6 drive combinations. This industry-unique design employs the front two axles in full-time, and the back axle kicks in as necessary — allowing unmatched off-road performance while reducing fuel consumption and tire wear. With oil-cooled, wet, multiple disc brakes on all three axles, stopping distance is impressively short — even on steep, muddy gradients. The Volvo A60H also offers a range of new standard features borrowed from the latest G-series model updates, each contributing to improved safety, productivity, efficiency and ease of serviceability. Hill Assist is a new safety and convenience feature that holds the hauler in place on steep slopes without the need to engage the parking brake. The feature automatically activates when arriving at a complete stop on a hill and is disengaged when the operator accelerates. Dump Support System allows the operator to see the percentage side inclination of the truck and set allowable parameters for safe operation. This new feature adds to the already user-friendly dumping process aided by Volvo’s patented load and dump brake technology with automatic hold and float tipping lever, which provides precise control for faster cycle times. On-Board Weighing now comes standard and is fully automatic. Three load indicator lights alert both the hauler operator and the excavator operator when nominal load has been reached and can warn the operators of overloading. The hauler operator can also see, in real-time, the actual tonnage displayed on the in-cab Contronics display, which also includes a new Econometer feature showing fuel economy in the form of gallon per transported ton, per work cycle for the last 10 cycles. This data is also shared and remotely accessible by the fleet manager through CareTrack, Volvo’s telematics system, allowing for complete payload management and improved fleet utilization. Serviceability improvements include a redesigned belly plate that can be electrically lowered and raised with the same hydraulic lever that is used for the engine hood, which opens to a full 90 degrees for easy, unrestricted access. Another improvement to the A60H is the no-grease tipping cylinders, which are maintenance-free, allowing for greater uptime and productivity. New orange accent colors on handrails, grill step and cab entrance now provide contrast for additional safety. The A60H is not just powerful and off-road capable — it’s incredibly durable, which is why it’s backed by a Lifetime Frame and Structure Warranty. The A60H’s frame and articulation/oscillation joint are protected for the entirety of the initial period of ownership or for the life of the machine — whichever is less. Further support for the A60H is offered from Volvo’s extensive dealer network, who can develop customized Customer Support Agreements with everything from maintenance plans and machine monitoring reporting via CareTrack and MATRIS, to uptime guarantees and full machine warranty options.